Wash, halve & de-seed the jalapeño peppers. Cut brie wheel into 16 approximately half-ounce pieces. Place 1/2 oz. 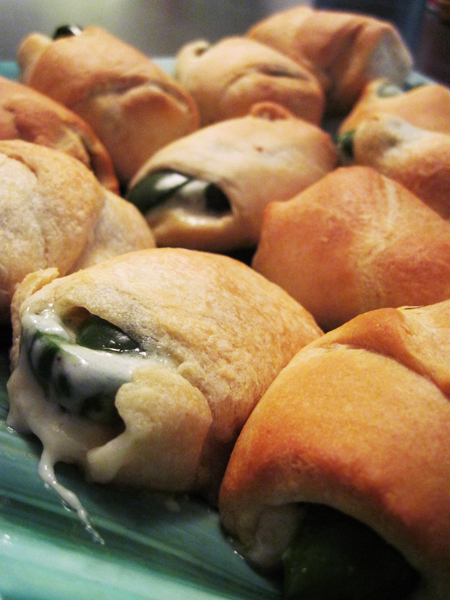 wedge of brie into jalapeño half and roll up in one crescent roll. Make sure to ensure cheese is fully covered, or you’ll have a higher risk of significant cheese leakage. Note: I made these with one whole jalapeño for each crescent roll, and it was too much to fit... they still turned out OK, but I think they’d be better with a half pepper per roll. Experiment with what you think works best. Place on baking pan (greased or lined with parchment paper) and bake for 16-20 minutes, or until browned. If you’re vegan, you can also try it with commercially available vegan cheese, or try to make you own vegan brie. I haven’t tried this yet, but this vegan brie cheese recipe may work out for you. Also, you’ll want to find a suitable vegan crescent roll (Pillsbury crescent dinner rolls are vegan if you don’t get the “butter flake” variety). This sounds awesome! I was looking for a good brie recipe.